If you came of age before 1980, you experienced the Reagan Revolution firsthand. You felt the joy and pride of America’s revival. So when Ronald Reagan said in his farewell speech from the Oval Office in 1989: “We made a difference. We made the city stronger, we made the city freer, and we left her in good hands,” you rejoiced with fellow Americans in your hope for the future. But since then, liberals who control education, the media, and government, have been obsessed with distorting Ronald Reagan’s ideas and accomplishments. Nearly 30 years of leftist indoctrination and government overreach have chipped away at many of the successes of the Reagan Revolution. But one stalwart of the Reagan era remains: You. You have remained true to your conservative principles. You have a passion for youth outreach, as did William F. Buckley, who founded YAF in 1960, and Ronald Reagan, who worked closely with YAF beginning in 1962, when he joined our advisory board. Buckley and Reagan are remembered and honored every day through the young people who go through Young America’s Foundation’s programs. This is their legacy at YAF; it can be your legacy, too. You can create a Personal Legacy of Educating Young People and Advancing Freedom. You may not see yourself as the type of individual who could leave a legacy. That’s why my wife, Michelle, and I thought until we encountered heroic individuals who passed on their ideas through estate gifts to Young America’s Foundation. These individuals would have humbly described themselves as “ordinary.” But leaving a legacy empowers ordinary people to achieve extraordinary things. Our advisors at Young America’s Foundation can help you create your legacy and protect freedom’s future. Please click on this link to flip through our “MAKING A DIFFERENCE” brochure. You and your advisors should feel free to call my colleague, Mark Trammell Esq., acting general counsel, or me at 800-USA-1776 anytime. 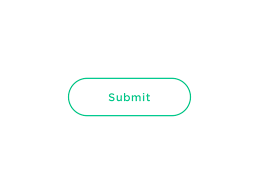 We would be honored to help you. 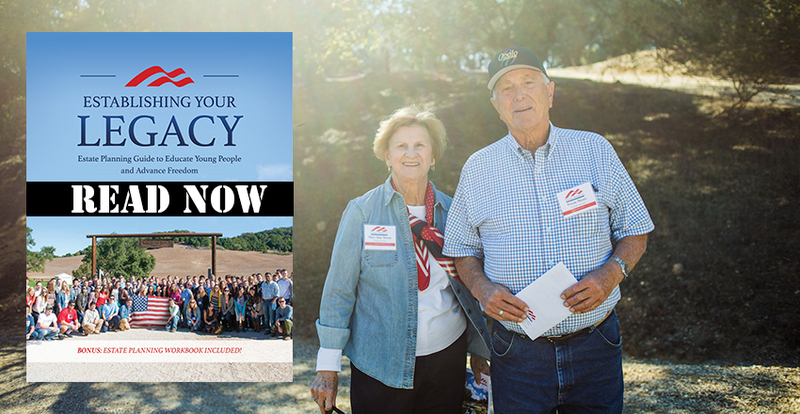 Share the good news that you intend to leave a legacy with Young America’s Foundation’s team. Please call Mark Trammell, Esq. at 800-USA-1776 to receive the benefits of Ranch in the Sky Legacy Society membership. Call your estate planning attorney to make an appointment. If you do not have an attorney, please contact Mark to request the name of a conservative attorney in your area. Share this bequest language with your attorney: I give, devise, and bequeath to Young America’s Foundation, tax identification number 23-7042029, 11480 Commerce Park Drive, Sixth Floor, Reston, Virginia 20191 [insert amount, percentage, or remainder of estate] to be used for educational purposes (or to support the Reagan Ranch). You can get a head start on your meeting by beginning to fill out Young America’s Foundation’s Estate Planning Workbook. Please call Mark Trammell, Esq. at 800-USA-1776 or fill out the form above to request a copy of this valuable resource. Q. WHY DOES YOUNG AMERICA’S FOUNDATION ASK FOR DOCUMENTATION OF LEGACY GIFTS? A. To help Protect Your Legacy. Sharing your documentation with Young America’s Foundation could protect your legacy. Sadly, before we began asking members of the Ranch In The Sky Legacy Society to share documentation of their estate gifts, we witnessed the legacies of several great conservatives jeopardized by decisions made by third parties. In each of these cases, there were foreseeable problems with the language or structure of the estate plans. If our team had had the opportunity to review these plans in advance, we could have alerted these supporters to problems. Advance review of their plans could have protected their intent and avoided costly litigation. Dr. Robert Ruhe, a longtime friend, supporter, and member of the Reagan Ranch Board of Governors, confirmed for us that our Legacy Society was incomplete until we offered documentation review. Over the course of many years, Dr. Ruhe had shared his plans to make a substantial estate gift. As soon as we received a copy of Dr. Ruhe’s trust upon his passing, we knew his gift was in jeopardy because his plans involved a third party (a donor advised fund with no history of giving to conservative causes) that was not legally required to honor his clearly-stated intent. Our fears were confirmed when the donor advised fund told us that Young America’s Foundation did not “have a seat at the table” of distribution discussions because they were not required by law to honor Dr. Ruhe’s intent. It took the intervention of two United States Attorneys General-Edwin Meese and John Ashcroft-to convince the donor advised fund to talk with us and ultimately honor Dr. Ruhe’s intent. Dr. Ruhe’s legacy gift enabled Young America’s Foundation to double our youth outreach programs! This was a huge victory for our students and the Conservative Movement. But it was almost a devastating loss-one that we know Dr. Ruhe would expect us to warn others about. We appreciate that most conservatives value their privacy. You and other conservatives may be reluctant to share copies of estate plans that you consider to be private. But we know you care deeply about passing on your ideas and you would not want a third party to interfere with your thoughtful plans for your legacy. That’s why we share Dr. Ruhe’s story with you, and why we invite you to share your documentation with our experienced team. You deserve to have peace of mind about your legacy. Supporters who share documentation of estate gifts to Young America’s Foundation are enrolled as Executive Members of the Ranch In The Sky Legacy Society. 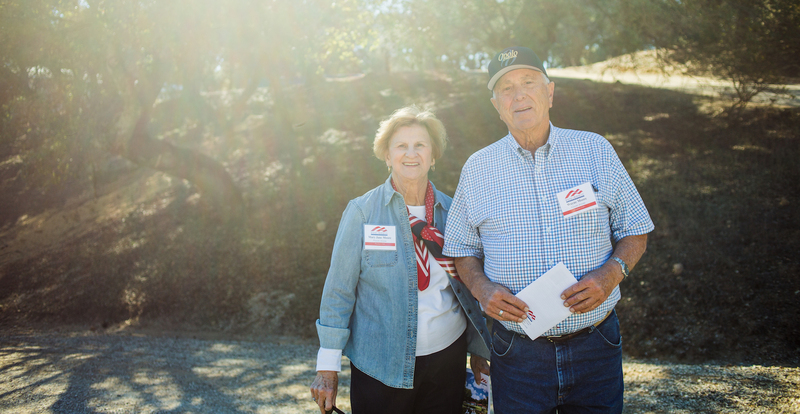 Executive Members receive special recognition: along with having your name listed on Freedom Wall, your name or the name of a loved one will be permanently engraved on a beautiful stone along the Freedom Lake pathway at the Reagan Ranch.